ACVic Centre d’Arts Contemporànies and Vic Jove join again in this summer's Cívicus Workshop. During the month of July 2017, two groups of 20 young people between the ages of 12 and 16 will collaborate in the construction of furniture in the area of the Vic Street Workout Park. Street Workout is a sporting discipline which is practiced in the open air. The park was installed this year at the Antoni Rovira Virgili Park (c. de l’Alguer) due to the demands of various youth groups who practiced this discipline in other urban spaces. 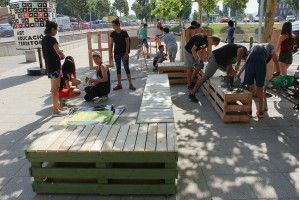 At the beginning of the workshop at ACVic, young participants from Cívicus visited the space of the intervention and assessed that there was a need to complement it with a rest-area. During the first week, the first participating group, 20 young people from 14 to 16 years old, designed and began constructing modules with tables and benches. During the second week, the other group, made up of young people from 12 to 14 years old, completed the construction of the furniture, painted it and installed it in the park. The workshop is by Carles Arumí, Jordi Arévalo and Roxanne Robinson, with the Civicus educational staff Gil Pratsobrerroca and Clàudia Toribio, Gerard Pasqual and Sara Tauste.